OnLive has announced plans to launch its streaming videogame service in June, with support from major publishers including Electronic Arts, Ubisoft, Take-Two and more. OnLive revealed yesterday that its cloud-based gaming service would be opened to the North American market on June 17, the last day of E3, for a monthly subscription fee of $14.95. That price "provides access to an ever-increasing library of high-end, new release game content and a host of exclusive community feature such as Brag Clips and massive spectating," OnLive Chief Operating Officer Mike McGarvey told MCV. "Individual titles will be available for purchase or rental on an a la carte basis. Specific game pricing, including rentals, purchases and loyalty programs, will be announced prior to the consumer launch event at E3," he said. "We'll also be announcing additional loyalty and discount programs for consumers in the coming months." OnLive launch titles will include Assassin's Creed 2 and Prince of Persia: The Forgotten Sands from Ubisoft and Metro 2033 from THQ, and McGarvey said the number of games being readied for the service was growing rapidly. "We're very pleased with the degree of publisher support received to date and have seen a rise in publisher interest in the OnLive Game Service as their focus begins shifting dramatically toward digital distribution," he added. 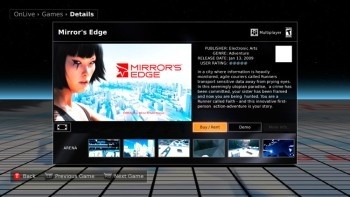 The service will initially only be available for the PC and Mac, and only in the U.S. McGarvey said an announcement regarding the promised "MicroConsole" would be made later this year and asked gamers to "stay tuned" for news about OnLive's European launch plans.